Laura Baldwin-Caldecoat is a top level Laser sailor and coach. She was Great Britain’s representative for the Europe class in the 2004 Olympics and the 2010 Australian Laser Radial Women’s Champion. Laura’s passion is now to coach sailors to reach their potential and she has set up H2O Sports Academy Australia to work with other top Laser sailors to provide coaching at all levels – from youth to masters; from beginners to champions; and for 4.7, Radial and Standard rig Lasers. 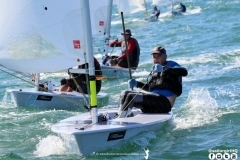 Click here to see Laura’s excellent clinic on laser sailing. It takes you through a broad range of key information, from rig selection, to setting up your boat, to sailing techniques and racing tips. Thanks to Laura for providing this information. If you would like to develop your skills further check out Laura’s web site by clicking on the logo below.